Located inside the Denver Center, the Buell Theatre stands as one of the leading entertainment venues in all of the “Mile High City.” The venue is a hub for all sorts of touring theater and music performers, including Broadway-caliber productions, world-class comedians, adored musical icons, and much more. No matter what type of event you’re into, there’s bound to be something on the Buell Theatre schedule to keep you entertained. See a selection of the latest Buell Theatre events if you’re ready to see an performance at this Denver Center venue. You can also keep reading this guide for more insight on different views across the Buell Theatre seating chart. The Buell Theatre seating chart holds three main levels, in addition to the scattered boxes located on either side wall of the theater. The main floor features the Orchestra Level and the Pit, which is often unavailable for theater shows with a live orchestra. One step above the Orchestra is the Mezzanine, which sits about halfway up the theater. Finally, the larger Balcony Level gives the most elevated view of the Buell Theatre stage. The Orchestra on the Main Floor is divided into five sections across the theater, where Section C is in the center. There are more than two dozen rows in the Orchestra that extend from the front of the stage to the rear of the theater, so Buell Theatre seating views can vary greatly in this level. If you’re sitting right in front of the stage, as shown in the photo below, you’ll be right on top of the action. Because the seats in the front few rows can sometimes feel too close to the stage, most fans prefer to sit in the central rows of the Orchestra. The front center rows of Section C house some of the best seats at Buell Theatre, as you can be close to the action while still enjoying a full view of the stage. The side sections of the Orchestra Level also allow fans to take in live shows from a close distance. It should be noted that you’ll have a slightly side-oriented view of the performance from these seats, but it isn’t usually anything that will block your view of the stage. 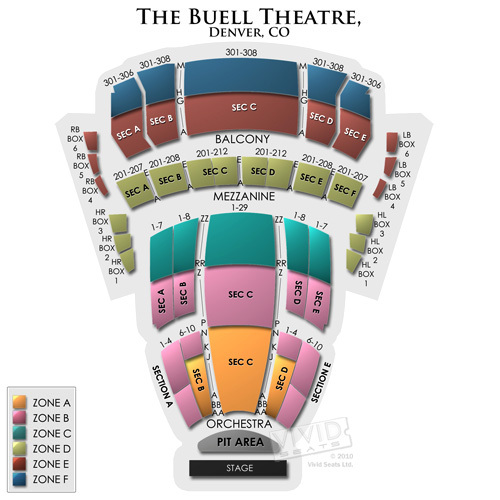 The Box seats in the Buell Theatre seating chart are the most unique option for live events. These semi-private boxes are situated at different heights along the theater walls, and fans sitting here have an excellent vantage point from which to view the audience and the stage. Since you’re seated to the side, you may have a slightly limited view of the action on your side of the stage depending on the performance. If you prefer an aerial view of the stage but don’t want to be too high up in the theater, select a seat in the Mezzanine Level. This relatively small level houses just a few rows, so it’s a little less crowded than other sections. The views at this level are also generally very good, no matter which section you choose. Finally, the Balcony is the uppermost level of seating available for Buell Theatre events. Since it is located farthest from the stage, the Balcony Level generally holds the most affordable seats. If you don’t mind being farther up in the theater, you can enjoy great elevated views from the Balcony. Even the rows farther back in the Balcony will offer a solid view of the performance. See a view of the stage from the upper Balcony in the photo below. Now that you know exactly where you want to sit, it’s time to secure your spot at the next show on the Buell Theatre schedule of events. Continue to view the complete list of upcoming performances by clicking the red “Tickets” button below. Click the "Tickets" link or call 866.848.8499 for order assistance.